Welcome to Lent, a time of fasting, almsgiving and prayer. For those of you who participate in this mystery, you’ll probably relate to some of my thoughts. For those of you who are not as familiar, hopefully you’ll learn something of interest today. The forty days of Lent offer time to prepare for Easter, and springtime. It is representative of the forty days Jesus spent in the desert prior to his earthly ministry. Before he could go out and do the work, he had to go within. What a great lesson. How many times do we seek important answers to life outside ourselves, when the answers lie deep within the silence of our hearts? When I think of fasting, I think of giving up ice cream or chocolate or meat on Fridays. I remember as a kid I’d give up green beans because I hated them. That never went over well. I’d get the “mom eye-roll” and was told that I could do better. Of course, I was missing the point entirely. Sometimes I still do. I like to follow Matthew Kelly’s advice for Lent. He says we shouldn’t give up chocolate. Sweet! 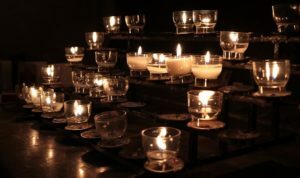 Instead, he suggests doing something that is life-changing; something that leads us to follow our dreams and become “the-very-best-version-of-ourselves.” This is awesome whether you are a Lent participant or not. Figure out what you could do between now and Easter that helps you be better than you are today. Boom! Here are some ideas that may lead to your own unique plan. Oh, and like I suggest when you are practicing healthier food and fitness habits, choose only ONE thing in each category that will truly make a difference. Too many things distract us and don’t stick long term. Most people I talk with have way more than they need. I’ve seen this idea presented in a number of ways and I’m jumping on board here. Choose one item a day. At the end of our desert time, you’ll have forty clothing items, books, household goods, food pantry donations, dollars, whatever, to give to your favorite organization that needs it more than you. Creative almsgiving. When we give, we open ourselves up to receive—and I don’t mean more stuff! Instead of fasting from chocolate, would it do you good to stay off social media and have meaningful conversations with your friends and family face-to-face? We’re planning to connect with friends (in person!) we haven’t seen for a time because “life gets in the way.” If the news makes you crazy, what if you spend some time in quiet solitude each morning? Is mindless TV taking you away from reading a book of interest or pursuing your dream to learn a new skill? Fast in a way that serves your soul, and it will benefit your entire being. Living in a way that leads to fulfilling our dreams is what God, our Creator, Spirit, a Higher Power, calls us to do. What can YOU do for the next forty days that will be life-changing in some way? In the midst of this extremely cold and snowy February comes the arrival of not one, but two feasting frenzy opportunities. Next week we will celebrate Mardi Gras, which is French for Fat Tuesday. 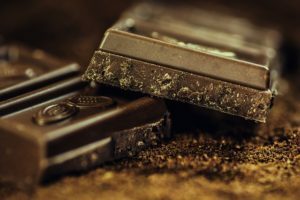 Celebrations occur and rich foods are traditionally eaten (yes, yet another excuse to stray), before the Christian Lenten fast that begins on Ash Wednesday, AND Valentine’s Day this year. The last time this occurred was in 1945. Now, the double holiday may present a bit of a quandary for those who follow the rules of fasting for the beginning of Lent. Catholics typically eat only one full meal and abstain from meat. This means surf without the turf—did I get that right? Anyway, no steak with your sweetheart is what that means. 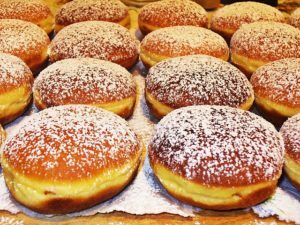 The Paczki, (POHNCH-kee), is the traditional Polish donut that is eaten to celebrate Fat Tuesday and–SURPRISE—is not the healthiest of foods. One of these offers somewhere in the neighborhood of 400 calories and about 20 fat grams, give or take–just ask My Fitness Pal. If you decide to indulge, it had better be AMAZING! One year I had the fun of being in New Orleans during Mardi Gras celebrations, which occur for about two weeks before Lent begins. New Orleans is the American city most known for its “Carnival” and parties. 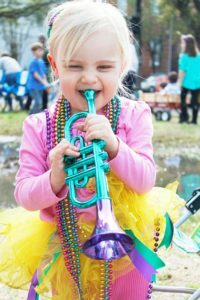 There were lots of parades, costumes, beads, delicious food, and celebrating. No, I did not do anything crazy to get those beads! The people on the floats throw them like Hoosiers throw candy. It’s all big fun. Fat Tuesday has been a legal holiday in Louisiana since 1875. Ash Wednesday marks the beginning of the Lenten season leading up to Easter, which is April 1 this year. No fooling. And in case you’ve wondered, Easter Sunday is celebrated on the first Sunday after the ecclesiastical full moon that occurs on or soonest after March 21, but calculations vary. This is the reason the date for Easter varies from year to year. Ash Wednesday is 46 days before Easter to allow for 40 weekdays of fasting and penance, which is a very good thing if you overindulged on the Paczki. However you celebrate next week, remember to eat a few extra vegetables. It won’t hurt! This is my favorite blog post of the year. Celebrating the Birth Month. I write it in February because…yes, you guessed it. February, which happens to be the shortest month, is my Birth Month. Celebrating my Birth Month has been my mantra for over a decade. I will be 59 years young, and one day of celebrating is simply not enough. Let’s face it– friends lose track of dates and then feel bad because their birthday greeting is belated. Please, do everyone a favor and join me in the Birth Month celebration. Some folks thought that was cheating. I think not. Besides, I made up the game; I figure I can make up the rules. I know there are people who deny birthdays and their age. However, I think it is fun to enjoy coconut cake with a fellow Birth Month friend, celebrate lunch with others, blow out candles, wish good things, and get more Facebook messages than I can keep up with. Last year my wonderful, non-compliant husband baked me a birthday cake FROM SCRATCH! It was amazing, and yes, I ate it. How does one manage eating through so many Birth Month festivities? Once again, it goes back to balance and making choices that keep me feeling not as old as 59 sounds: keep my workout dates at the gym, where I see lots of my friends and we are not eating; drink plenty of water; remember to eat more vegetables and fruits than coconut cake; eat slowly, savor every bite, and enjoy the company; save half of whatever I order to take home so I have another fun lunch the next day. I love to eat spinach salads with chicken, so it’s not that tough. Oh, and when you celebrate over about 60 days, you can space out those lunch dates so you aren’t feeling like a stuffed turkey at Thanksgiving. The other cool thing about enjoying the Birth Month is that there is plenty of time to reflect. Am I spending my time on what truly matters to me today? If I am, perfect. If not, then I have this moment to make adjustments. With each Birth Month celebration comes a calm sense of urgency. Having a finite number of these forces me to Live Large now. Thanks for reading. I hope you have a fabulous February and consider joining me in the Birth Month mantra when it’s your time. Try it, you’ll like it. By the time 60 rolls around, I’ll probably be all about the Birth Year. In fact, I think I’ll begin today. You are not bad. Pizza is not necessarily bad. What is sometimes bad is the effect it has on the body (if it is greasy, there is a food sensitivity, or we over do it) and the mental state we take on when we are supposed to be eating healthy. To be clear, I enjoy pizza. I enjoy ice cream. I enjoy many foods that could be classified as “bad.” The foods we choose to eat either lead us toward our health and fitness goals, or away from our health and fitness goals. There is not really neutral territory here. I recommend you stop thinking that you are bad when you eat the pizza and good when you eat the salad. The way we think is our reality, and eating a certain food does not make us bad or good. This thinking only gives you a complex that is based on crazy evidence. Here’s a healthier way to think about this whole thing. For the most part, if we eat in a way that leads us toward our health goals most of the time, say 80%, we will probably meet them. Allowing 20% for the occasions when we choose the pizza or ice cream or whatever, will not break us. Of course, if you discover you feel much better when you choose the 80% way, you may be inclined to increase that number. Do I hear 85%? Another thought: stop eating said food before you are stuffed. Stop eating when you are 80% full. Eat slowly and savor whatever it is that you’re eating, whether it’s the salad or the coconut cake. Stop before you need to loosen your belt a notch or unbutton that top button on your pants. Allow your stomach to tell your brain that you need to stop or you will feel bad—not so much because of what you ate, but because you overate! One of the habits I try to follow is eating a tossed salad before or with the pizza. By doing this, I take the edge off my appetite. I enjoy the pizza, I am satisfied and I don’t eat so much pizza that I feel bad. This is a much better tactic than complete denial of a favorite food, then going off the deep end one day and eating uncontrollably. Another trick is to drink plenty of water, no matter what. We need to hydrate daily, winter and summer, and this helps stop out-of-control eating. There are options when it comes to choosing foods that seem rather indulgent. Homemade (from scratch) pizza will most likely be healthier than frozen. If you make your pizza using quality ingredients, vegetables, lean protein, and a thin whole grain crust, you take it to an entirely different level. There are frozen varieties that are organic or gluten free or have fewer preservatives. Sometimes, we simply have to meet up with our friends, have fun and go with the flow. Then you know my rule: Only eat it if it’s AMAZING! Enjoy every bite and feel good. “Consistency not novelty is the secret to uncommon results.”- Dr. John Berardi.